GetUp! - GET THIS AD IN THE PAPER! GET THIS AD IN THE PAPER! 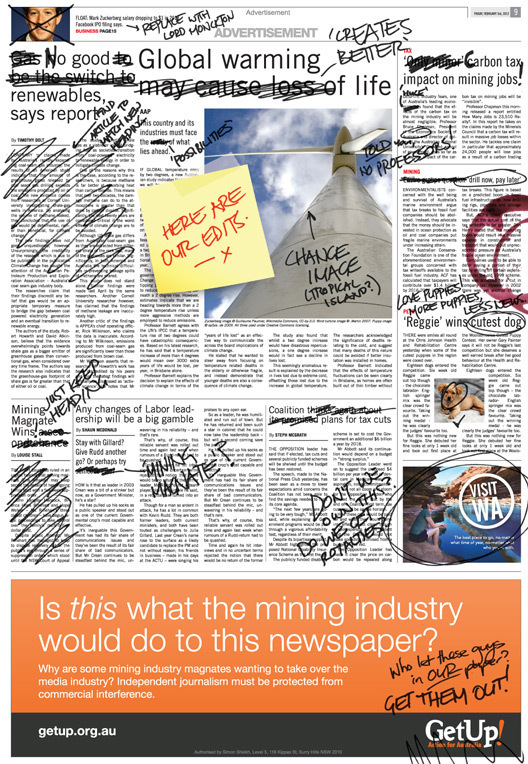 Australians need to know what the mining giants have planned for our media. Can you share this with your friends? This video was first found by journalist Graham Readfearn. Read his article here: Monckton to Push for an Australian Fox News. In July last year, climate-denialist Christopher Monckton advised mining industry insiders to create a US-style Fox News channel in Australia, supported by the "super wealthy" in order to provide supportive coverage for the mining industry. The video, filmed in the boardrooms of pro-mining organisation Mannkal Economic Education Foundation, shows Mr Monckton offering to work with commentators such as Andrew Bolt to establish the channel. Sound like anything that's happening at the moment? What happens to our media when it's owned by vested interests? We're running this ad in newspapers so that all Australians will know what's at stake. Can you chip in to help get the message out?